Andy’s Pest Control – Sawdust from Ants? 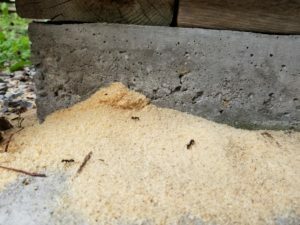 Seeing Sawdust from carpenter ants? Carpenter ants are in full swing, as they are creating or expanding their colonies they bore into wood. As they create their galleries, they have to find an area to discard the little pieces of wood that they have excavated. Wood boring ants such as Acrobat ants and Carpenter ants produce frass, and it can accumulate quickly. Frass produced from carpenter ants. Over time, carpenter ants can become a big problem as they can cause structural damage to your property. They prefer damp or rotted wood because it’s easy for them to bore into, and provides the humidity needed to thrive, making it an ideal place to make their nests. As the galleries grow, the integrity of the wood is put at risk. I see frass, what should I do? If you are seeing frass in or around your home or cottage, the best thing to do is to call a professional pest control company. Andy’s Pest Control includes a full inspection, and gives you treatment options that best suit your needs and will provide preventative solutions to help control your pest issue. All of our full treatments include a full one year warranty. Don’t let carpenter ants take over your home or cottage. Call today to book your treatment! Andy’s Pest Control services all of Peterborough and the Kawartha Lakes, including Bancroft, Apsley, Haliburton and Minden. We specialize in home and cottage pest control.